This year’s Artes Mundi exhibition opened at the National Museum of Wales, Cardiff last month. Since it’s conception in 2003, the international Artes Mundi scheme (and award) has celebrated and exhibited contemporary New Media Art from a wide range of cultural backgrounds and countries. The idea amongst all, to connect Wales to a global modern art sphere. This year’s overall theme was ‘Humanity’. Eight artists have been shortlisted for the award, all of whom are exhibited at the museum. The modern works include video installations/films, photography stills, lightbox images and ink drawings – with only one painting. Highlights include Peru-born Fernando Bryce’s work, which looks at the ways in which print media reports and covers historical events. Bryce questions the perceptions of history and the construction of what we take as fact. He does so by imitating print media and through appropriation of newspapers and various prints. The images he produces are beautifully hand-drawn in ink, and challenge how we read and accept ‘facts’ in the media. Chen Chieh-Jen uses film and photography to portray working labour, the social history and the working people who have been forgotten amidst growing consumerism. Chen’s stunning film ‘Factory’ is a beautifully shot piece, highlighting the plight of a factory in Thailand, now derelict; a victim of cheaper labour elsewhere. Amongst the ghostly rubble and machinery, he places former workers, silent in their protest at the way they were treated/sacked; forgotten workers, whose toil and mundane drudgery were unfairly ignored. Chen gives them a voice despite their silence, through slow moving camera-shots amongst the cob-webs, the melancholic death of an industry. The poetic camera-angles of the aesthetic are a stark contrast to the decay of the topic, or indeed, the corruption in consumerism he wishes to portray. Other exhibits include video installations and works dealing with issues in immigration, post industrialism, collapse of the Soviet Union and the deconstruction of Zionism. With artists from Albania, Peru, Russia and Kyrgyzstan amongst others, the Artes Mundi successfully brings world class art to Wales and illustrates New Media Art’s worth in expressing serious contemporary issues facing the world today. The Artes Mundi exhibition runs at the National Museum of Wales, Cardiff until June 6th. The winner will be announced on May 19th. 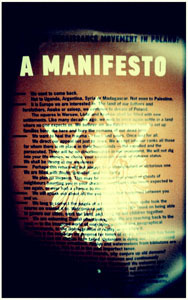 Image by Sian Prescott – of Yael Bartana’s poster Manifesto, which visitors are encouraged to take home with them. Robert McGinnis is a prolific American artist, responsible for illustrations adorning the covers of over 1,000 paperbacks. 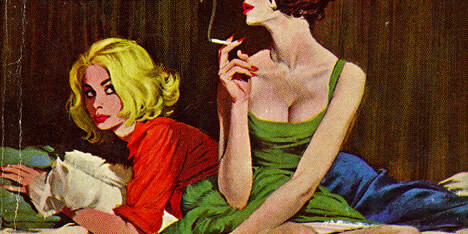 Much of his work concentrates on the crime/mystery genre, which features alluring, semi-naked women, as clearly demonstrated in the Robert McGinnis Flickr pool. His talents are also employed for movie posters. Among the most memorable of his film output to date are the posters for Breakfast At Tiffany’s, The Man With The Golden Gun (along with many other James Bond posters), and the collectable cult-classic poster for Barbarella. A recent documentary, Painting the Last Rose of Summer (2008), beautifully captures his story and creative process.